The Vickers Warwick was a multi-purpose British aircraft used during the Second World War. Built by Vickers-Armstrongs at Brooklands, Surrey, the Warwick was used by the Royal Air Force (RAF) as a transport, air-sea rescue and maritime reconnaissance platform and by the civilian British Overseas Airways Corporation (BOAC). Picture - A section of the rear fuselage from a Warwick showing the geodesic construction in duralumin. On exhibit at the Armstrong & Aviation Museum at Bamburgh Castle. The Warwick was designed to meet Air Ministry specification B.1/35 for a two-engined heavy (by the standards of the day) bomber. It was designed in parallel with the smaller Wellington, both being derived from the Vickers Type 271 design to Specification B.9/32. Vickers-Armstrongs completed two prototypes, with the first, (serial K8178) powered by Rolls-Royce Vulture liquid-cooled "X" engines flying from Brooklands on 13 August 1939, with the second prototype (L9704), originally designed with a Napier Sabre powerplant, was fitted with the Bristol Centaurus radial engine flying on 5 April 1940. The Vulture engine proved unreliable, and while the Centaurus powered prototype was more promising, its development was at an early stage, and use of the American Pratt & Whitney Double Wasp radial was proposed, with the second prototype being converted to use the R-2800-S14A4-G engines and first flying in this form in July 1941. The Warwick used Barnes Wallis' geodesic airframe construction pioneered in the Wellesley and Wellington. In this system, a network of intersecting structural members made from duralumin were covered by wired-on fabric. The load was distributed amongst the structure, providing great redundancy in the event of damage, at the expense of complexity of construction. An initial production order for 250 Warwicks, consisting of 150 Double Wasp powered Mk Is and 100 Centaurus powered Mk IIs was placed on 28 December 1940. A total of 219 Warwick Mark Is were built, the last 95 with 2,000 hp (1,500 kW) R-2800-47 engines. Production Warwick Mk Is started to be delivered to the RAF for testing in July 1942. 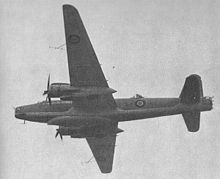 Only 16 aircraft were delivered as bombers, as by this time more capable four-engined heavy bombers such as the Short Stirling and Handley Page Halifax were in service. The Warwick was subsequently considered for transport and air-sea rescue roles. 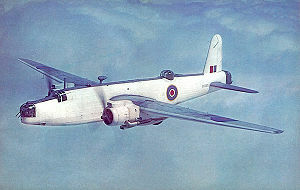 After BV243 was successfully converted into a transport to serve as a trial aircraft, an additional 13 Mk Is were converted on the production line as C Mk 1 transports for use by BOAC, being used briefly on its Middle East services before being transferred back to RAF Transport Command in 1944. 100 similar aircraft were built for the RAF as Warwick C Mk IIIs, entering service with 525 Squadron in June 1944. They were mainly used in the Mediterranean theatre, until being retired in 1946. The remainder of the first batch of 250 Warwicks were used by the RAF Coastal Command for anti-submarine reconnaissance. From 1943 Warwicks were loaded with the 1,700 lb (770 kg) Mk IA airborne lifeboat and used for air-sea rescue. The lifeboat, designed by yachtsman Uffa Fox, laden with supplies and powered by two 4 hp (3 kW) motors, was aimed with a bombsight near to ditched air crew and dropped on parachutes into the sea from an altitude of about 700 ft (320 m). Warwicks were credited with rescuing crews from Halifaxes, Lancasters, Wellingtons and Fortresses, and during the Arnhem landings, from Hamilcar gliders. A production order for 525 Warwick Mk V was placed although 235 were ultimately completed, most going directly into storage in 1944. 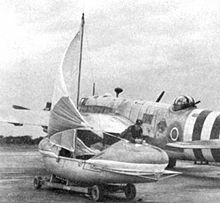 In early 1945, the variant was issued to 179 Squadron at St. Eval while 17 and 27 Squadrons of the South African Air Force also received the Mk V.
Picture - A rigged airborne lifeboat in front of a Warwick with D-Day identification stripes. Warwick B Mk I - original production bomber, of 150 ordered, only 16 aircraft were built. They were used for a variety of tests. Warwick C Mk I or Vickers Type 456 - transport version for BOAC, for use on its Mediterranean and North African routes. 14 built. Warwick B/ASR Mk I - 40 aircraft converted from the Warwick B.Mk I bomber. The Warwick ASRs were used as air-sea rescue aircraft. They could carry two sets of Lindholme lifesaving equipment. Warwick ASR (Stage A) - 10 aircraft converted from the Warwick B Mk 1 bomber. The Warwick ASR (Stage A) was used for air-sea rescue. They could carry one airborne lifeboat and two sets of Lindholme lifesaving equipment. Warwick ASR (Stage B) - 20 aircraft converted from the Warwick B Mk 1 bomber. The Warwick ASR (Stage B) were air-sea rescue aircraft, carrying the same equipment as the Warwick ASRs and ASR (Stage As). Warwick ASR Mk I or Type 462 was an air-sea rescue version, it could carry an airborne lifeboat. The aircraft was powered by two 1,850 hp (1380 kW) Pratt & Whitney Double Wasp R-2800-S1A4G radial piston engines; 205 built. Warwick B Mk II or Vickers Type 413 - bomber prototype, only one exaple was ever built, converted from a Warwick B Mk I.
Warwick GR Mk II or Vickers Type 469 - anti-submarine, general reconnaissance version. It was equipped to carry torpedoes and bombs. It was powered two 2,500 hp (1,864 kW) Bristol Centaurus VI radial piston engines; 118 built. Warwick GR Mk II Met - meteorological reconnaissance version of the Warwick GR Mk II; 14 built. Warwick C Mk III or Vickers 'Type 460 - transport version. It had a pannier-like extension below the central fuselage, the normal loaded weight being raised to 45,000 lb (20,400 kg). It could carry 24 equipped troops or eight to 10 passengers in the VIP version. No armament was carried; 100 built. Warwick ASR Mk VI or Vickers Type 485 - final air-sea rescue version. The aircraft was powered by two Pratt & Whitney R-2800-2SBG Double Wasp radial piston engines; 94 built. Warwick GR Mk V or Vickers Type 474 - anti-submarine, general reconnaissance aircraft. It was powered by two Bristol Centaurus VII radial piston engines, armed with 7 machine guns and could carry 6,000 lb (2,700 kg) of bombs, mines or depth-charges. A Leigh light was fitted ventrally. It arrived too late to see service; 210 built. "Airborne Lifeboats:Fully Provisioned Power Lifeboat Dropped to Ditched Air Crews". Flight, 18 January 1945, pp. 62-64. Barfield, Norman. "Vickers-Armstrongs Warwick variants". Aircraft in Profile, Volume 11. Windsor, Berkshire, UK: Profile Publications Ltd., 1972. "Dropping an Airborne Lifeboat". Flight, 8 March 1945, p. 253. Green, William and Gordon Scarborough. WW2 Fact Files: RAF Bombers, Part 2. London: Jane's Publishing Company Ltd., 1981. ISBN 0-7106-0118-2. Jones, Barry. "Database:Vickers Warwick". Aeroplane, June 2010, Vol 38 No 6, Issue No 446. London:IPC. ISSN 0143-7240. pp. 63-78. March, Daniel J. (editor). British Warplanes of World War II. London: Aerospace, 1998. ISBN 1-874023-92-1. Taylor, John W.R. "Vickers Warwick". Combat Aircraft of the World from 1909 to the Present. New York: G.P. Putnam's Sons, 1969. ISBN 0-425-03633-2. "Vickers 284 Warwick." Control Column, Official Organ of the British Aircraft Preservation Council, Volume 11, No. 2, February/March 1977.